ATTENTION: Coaches, Virtual Assistants, Consultants and others who frequently book appointments with clients…. Here’s a frustrating scenario: You receive an email from a potential new client requesting a consult. Yay! You quickly send a reply with your available times and dates, and wait for your new client to get back to you with her availability. Of course, by the time she does respond, you’ve already made other plans for the block of time she requests. Ugh! Round two of emailing potential times and waiting for a response. It’s frustrating for you, and imagine how it makes you look to your new client? Truthfully, you come across as more than a little disorganized. Not only that, but how much time have you just wasted simply trying to schedule a consultation or discovery session? Gives you the power to determine holidays. We all work different schedules, and Appointment Scheduler lets you decide when you’re working–and when you’re not. Stop wasting time with manual scheduling. 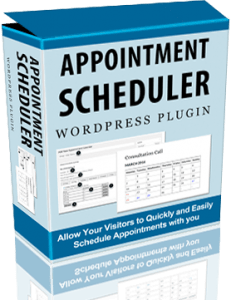 Install the Appointment Scheduler plugin for WordPress today and discover the easy way to get paid and fill your calendar, so you can get back to work. Yes! Sign me up! I’ve been searching for a simple solution to my calendar scheduling frustrations! The easy-to-install WordPress plugin that I can simply upload to my website. Full usage instructions so I can have my new calendars set up in just minutes. The option to integrate with PayPal so I can take payments in conjunction with scheduled appointments. This is just what I’ve needed to automate my scheduling process. I can’t wait to get started! P.S. If you’ve ever spent half a day on back-and-forth emails before finally settling on a mutually acceptable appointment, then you must have this new plugin. It will pay for itself with just one booking. P.P.S. Remember, your purchase is backed by my 100% money-back guarantee. If the Appointment Book plugin doesn’t work exactly as I claim, just email me for a prompt, courteous refund.